Neighborhood Watch is a group of neighbors working together to reduce and prevent crime. Neighborhood Watch is not a group of vigilantes taking the law into their own hands, nor do Neighborhood Watch groups take the place of the Sheriff’s Office in enforcing the law or arresting criminals. Nationally, there is about one officer for every 2,000 citizens. Neighborhood Watch increases police effectiveness by having neighbors report suspicious or criminal activity to the Sheriff’s Office. Officers don’t recognize abnormal activity in a neighborhood nearly as well as neighbors do. Members of Neighborhood Watch get to know their neighbors, learn how to make their homes and property more secure, watch out for each other and their neighborhood, and report activities that raise suspicion. What can I do to keep my neighborhood safe? Be informed and aware of area and community crime activity. Teach your children, grandchildren, or babysitter how to handle a stranger at the door or on the telephone. Use crime prevention tips by lighting up your residence, locking your home and vehicles, and avoiding displaying your property in your vehicle or home. Work together with your neighbors. Good communication is key. Note license plate numbers and descriptions of suspicious vehicles. Report crime and suspicions to the Sheriff’s Office and your Neighborhood Watch area coordinator. How do I get a Neighborhood Watch started in my neighborhood? If you live in Eagle, Kuna, Star, or any unincorporated area of Ada County, contact the Community Information Unit of the Ada County Sheriff’s Office for help in organizing your group. Contact Community Relations Officer Nicole Carr or (208) 577-3775 to get started. Each group decides when, where, and how often to meet. Deputies are available to help with those meetings and to give information about specific topics of interest to your group. National Night Out is an annual community-building campaign that promotes police-community partnerships and neighborhood togetherness. It’s one way we all work together to make Ada County neighborhoods safer places to live, work, and play. Each year, millions of neighbors all across the US take part in National Night Out on the first Tuesday in August. In 2019, it’s set for Tuesday, August 6th. 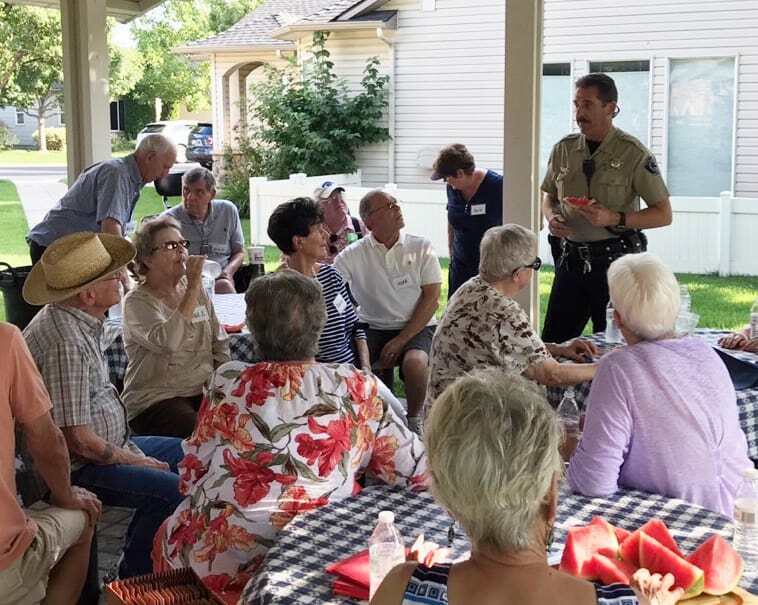 Neighborhoods all over Ada County will host block parties, potlucks, ice cream socials, festivals and various community events that night— and Ada County Sheriff’s Office deputies and other employees will stop by and visit. This event is open to all neighborhood associations and groups, including Neighborhood Watch, HOAs, and other organizations. We look forward to celebrating this fun event with you! Help you get your neighborhood organized. Attend your first Neighborhood Watch meeting. Share important information to area coordinators in your neighborhood. Help with additional educational neighborhood meetings. Complete an application and submit it to the ACSO for approval to be named area coordinator. The ACSO will review the application and complete a national background check. Once approved, the area coordinator will be the main contact between the Sheriff’s Office and your Neighborhood Watch group. They will distribute information from the Sheriff’s Office to the block captains. The area coordinator will organize block captains to best cover the neighborhood, recruit replacement block captains when positions open up, buy Neighborhood Watch signs and install them at each entrance to the neighborhood, and encourage block captains to have biannual meetings with Neighborhood Watch residents. Pass on information received from area coordinator to neighborhood homes. Meet with neighbors on a semi-annual basis (a Community Relations Officer can make presentations at these meetings or you might have a Block Party). Collect money for the Neighborhood Watch Signs. Maintain, update and distribute New Neighbor Packets. New Neighbor Packets should contain a cover letter, neighborhood phone and/or email list, and various pamphlets. Notify Area Coordinator if no longer able to perform block captain duties. Watch out for each other’s property. Report any suspicious activity to the Sheriff’s Office. Know the neighbors across the street from your home, on each side and the three neighbors behind you. Have an increased awareness for your neighbors’ safety and report suspicious activity to the police.